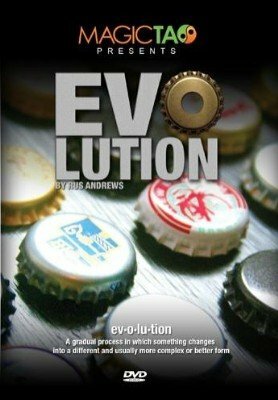 Evolution is an impromptu approach to the classic cap in bottle effect. Imagine being able to take an empty beer bottle from a random table in a bar or nightclub, then taking any bottle cap, perhaps from behind the bar or from another drink… Have the spectator sign the cap and then, visually, whilst the spectator is holding the bottle; penetrate the cap through the bottle leaving the signed cap inside. This can then be given to the spectator and kept as a souvenir. Everything can be left with the spectator. For those that do not want to perform the impromptu un-gimmicked effect we also supply you with a gimmicked version that you can use to perform the same effect. You will have to make the gimmick yourself. Instructions are on the video.